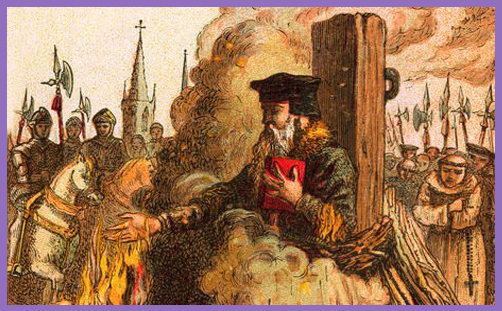 On this day, 459 years ago, a man was burned at the stake for ‘heresy’ – essentially for holding conflicting personal, political and theological loyalties. He bequeathed to us a tome of carefully balanced liturgical poetry and prose, reflecting an anguished attempt to hold together a church and nation in crisis. As the Book of Common Prayer is incrementally discarded by the church and forgotten by the nation, the same crisis re-emerges as people’s political beliefs and theological loyalties are stretched to breaking point. On which we still draw? It didn’t sound like an archbishop who would obligingly bow to the gods of this age or meekly roll over when Parliament asserts its immutable creed of uniformity. And he has not done so. But he does both recognise and agonise over the limitations of his constitutional role, which occasionally require him to hold conflicting personal, political and theological loyalties. But there is no need for him to hold his hand in the fire: if Christians aren’t exhorting him to cut it off, the media are roasting it along with his forearm, if not the whole episcopal torso. Transformation, renewal and reconciliation precede the confident declaration of the Good News of Jesus Christ. You may not agree with every word Archbishop Justin utters or every pragmatic decision he takes in the service of the Church, but don’t ever judge the man’s heart or motives. For he has declared himself to be, like St Benedict, a man of prayer and contemplation; possessing the courage, like Archbishop Cranmer, to take risks in defence of the Truth. Cranmer lived in the middle of controversies where striking for a kill was the aim of most debaters. Now of course we must beware of misunderstanding or modernising. He was not by any stretch of the imagination a man who had no care for the truth, a man who thought that any and every expression of Christian doctrine was equally valid; he could be fierce and lucidly uncompromising when up against an opponent like Bishop Gardiner. Yet even as a controversialist he shows signs of this penitent scrupulosity in language: yes, this is the truth, this is what obedience to the Word demands – but , when we have clarified what we must on no account say, we still have to come with patience and painstaking slowness to crafting what we do say. Our task is not to lay down some overwhelmingly simple formula but to suggest and guide, to build up the structure that will lead us from this angle and that towards the one luminous reality. ‘Full, perfect and sufficient’ – each word to the superficial ear capable of being replaced by either of the others, yet each with its own resonance, its own direction into the mystery, and, as we gradually realise, not one of them in fact dispensable. …And in his last days, this was Cranmer’s curse. If there was no easy certainty enough to kill for, was there certainty enough to die for? That habit of mind which had always circled and hovered, tested words and set them to work against each other in fruitful tension, sought to embody in words the reality of penitence and self-scrutiny, condemned him, especially in the midst of isolation, confusion, threats and seductions of spirit, to a long agony, whose end came only in this church minutes before his last hurrying, stumbling walk through the rain to the stake. It is extraordinary to think of him drafting two contradictory versions of his final public confession, still not knowing what words should sum up his struggles. But at the last, it is as if he emerges from the cloud of words heaped up in balance and argument and counterpoint, knowing almost nothing except that he cannot bring himself to lie, in the face of death and judgement. What he has to say is that he has ‘written many things untrue’ and that he cannot face God without admitting this. He cannot find a formula that will conceal his heart from God, and he knows that his heart is, as it has long been, given to the God whom the Reformation had let him see, the God of free grace, never bound by the works or words of men and women. Just because he faces a God who can never be captured in one set of words, a God who is transcendently holy in a way that exacts from human language the most scrupulous scepticism and the most painstaking elaboration possible, he cannot pretend that words alone will save him. ‘If we deny him, he also will deny us’. He must repent and show his repentance with life as well as lips; ‘forasmuch as my hand offended in writing contrary to my heart, therefore my hand shall first be punished’. …It led Cranmer – as it led so many others in that nightmare age, as it led the martyrs of our own age – Bonhoeffer, Maria Skobtsova, Janani Luwum – to something more than a contemplative silence: to a real death. When we say that the word of God is not bound, we say that death itself can be the living speech of God, as the Word was uttered once and for all in the silence at the end of Good Friday. Cranmer speaks, not only in the controlled passion of those tight balances and repetitions in his Prayer Book, but in that chilling final quarter of an hour. He ran through the downpour to the town ditch and held out his right hand, his writing hand, for a final composition, a final liturgy. And, because the word of God is not bound, it is as if that hand in the flames becomes an icon of the right hand of Majesty stretched out to us for defence and mercy. Let this blessed day be a day to remember all of our brothers and sisters around the world who are being persecuted, tortured and murdered for their faith in defence of the Truth. May they be strengthened by His grace.